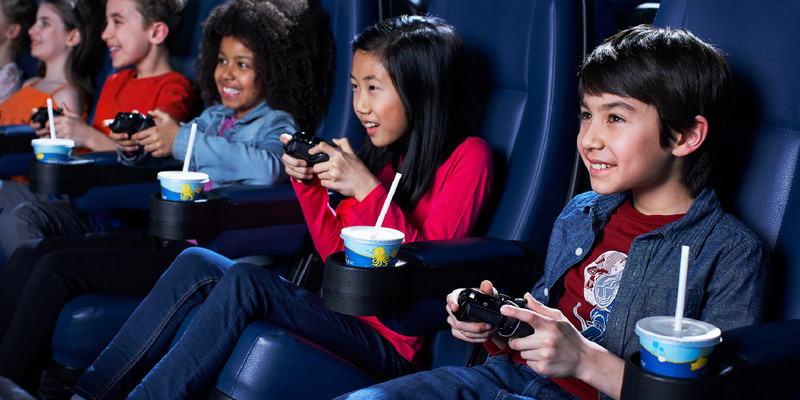 Take your gaming to the next level on the big screen! With a private theatre booked just for you and your crew, you’ve never played like this before. Bring your own favourite Xbox One games or choose from your theatre’s selection. Want to make it a tournament? Our organized templates make it easy to keep track of who’s ahead. There is no minimum for groups however, it is recommended that the group size is between 8 and 12 people. This will maximize game time for each player. Feel free to bring your own Xbox game to play (personal game consoles or games for other game consoles are not permitted). There is no age limit for Video games parties on Xbox, but parental discretion is required (if applicable) on game ratings meant for older gamers (i.e., any ‘M’ rated titles). Parties can be requested a maximum of 6 weeks prior to your preferred party date and are not guaranteed until the date has been confirmed and booked by the theatre. A $50 deposit may be required for each party and can be paid at the box office at any point in advance of the party. The booking may not be reserved until the deposit has been received. Cancellations made with less than 24 hours notice may result in a non-refundable deposit. Outside food and beverages are not permitted in the theatre complexes however if you are celebrating a birthday feel free to bring your own birthday cake! We will supply the plates, napkins and cutlery. Parties can be booked at anytime during non-operating hours. A sample booking is Saturday, 10am – 12pm or any night after 10:30pm, pending availability at select theatres and can be confirmed directly with the theatre. Gift cards, all major credit cards, and debit cards are accepted as form of payment. Party bookings may not be available during weekdays at some locations. SCENE Points are awarded after the day of the party after full payment has been processed. * Xbox Live subject to current internet connectivity and internet speeds may vary between participating locations. * Requirements and available features pertaining to Xbox Live multiplayer gameplay will vary across consoles and game titles. Use the calculator to estimate your party cost, then submit your request to book. A party representative will be in touch with you shortly to finalize details and complete your booking.